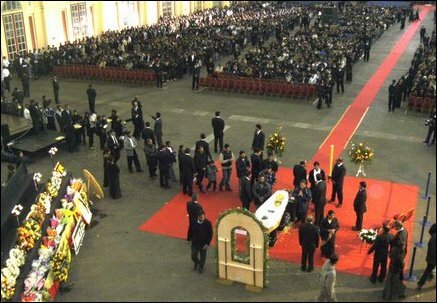 Balasingham’s casket was placed at the front of the Palace’s Great Hall at 8:00 a.m. Wednesday. It was escorted in by an honour guard, white gloved and dressed in black suits. A brief initial ceremony was held attended by hundreds of Tamil activists, including many who had flown from other Tamil Diaspora centres around the world. The activists then filed past, placing flower petals on Balasingham’s body, followed by a long line of Tamils who did the same. 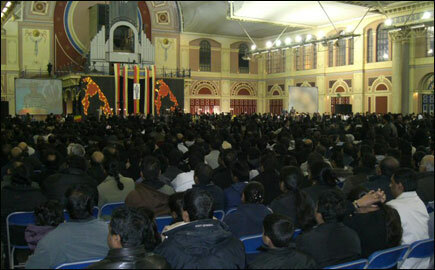 Families with children, youth and older Tamils are among those paying respects. Many wept openly, others prayed. Some lifted young children so they could place petals also. Mrs. Adele Balasingham [centre] with her family and friends. Dozens of wreaths and bouquets are being placed alongside the casket by mourners as they pass. Community organizations from across the world have sent representatives with wreaths. ‘Voice of the Nation’ said one, the title bestowed on the LTTE theoretician by the movement. ‘Uncle’ said another, the title by which many LTTE cadres address Balasingham. 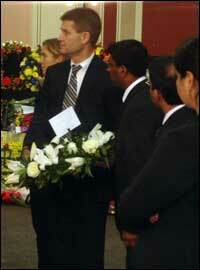 Mr. Erik Solheim, International Development Minister of Norway attending the funeral. Thousands of people are waiting outside the venue on a freezing cold day as the queue snaked back from the Great Hall, where thousands more are also waiting. Hundreds of activists urged mourners to keep moving in an effort to give those waiting an opportunity to pay their respects. Expatriate Tamils from across Europe have been arriving through the day. Several coaches came from Switzerland, France and Germany. Several planes had been chartered by Tamils in Norway. 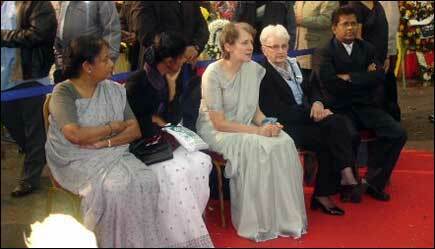 Large numbers of Tamils from Canada, US and Australia arrived in the preceding two days. The event is expected to conclude at 2:30p.m. Balasingham is to be cremated shortly afterwards at a private ceremony.